The Parish held a dinner for a worthy cause last May 15 to coincide with the pastoral visit of His Excellency Bp. Antonio R. Tobias, DD. This was in response to our Bishop's invitation to help raise funds to build the Kristong Hari Parish and Shrine for the Youth along Commonwealth Avenue. A total of 150 tickets were printed and sold to the different ministries, organizations, parishioners and friends at Php 500 each. Aside from His Excellency, the highly successful dinner was also graced by the presence of Fr. Roland Jaluag, parish priest of Kristong Hari. A short video clip of the proposed shrine was shown after the dinner proper. 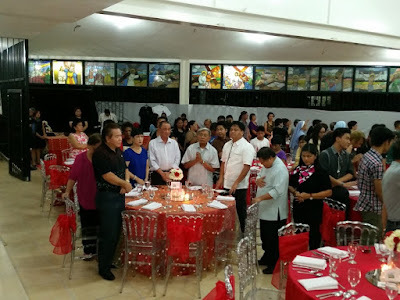 Kuya Peter Tamayo, the PPC Chairperson welcomed the guests on behalf of the parish. A couple of songs were rendered by Ate Cora Pangyarihan while some from the different youth choirs also helped liven up the evening. Ate Josie Cruz & Ate Heidi Temporal facilitated the program and lady volunteers from the different ministries served as ushers. The project raised a net total amount of P82,214.